Guys, what’s more Strayan’ than a pie? 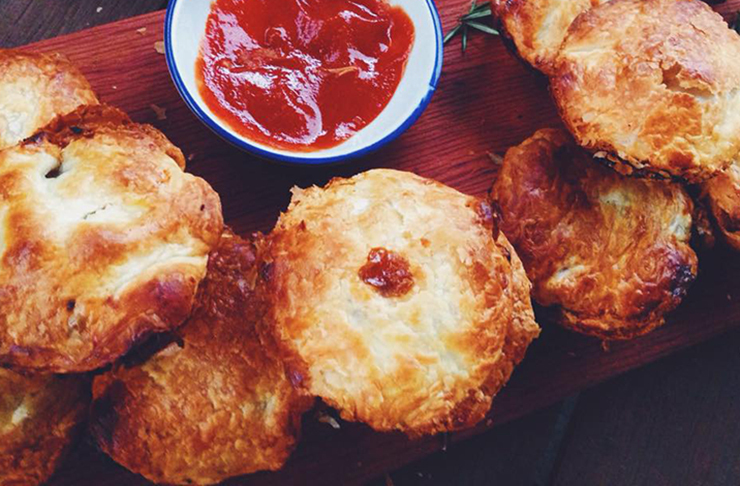 We reckon you'd be hard pressed to find something as Aussie as the good ol’ pie so Australia Day is the perfect day to whip these babies up and be everyone’s best friend. The brainchild of the lovely ladies at This Little Pig Went To Market, these pepper steak and mushroom pies are rustic-looking, rich and buttery—basically, delicious little morsels that will beg you to eat them. So push back the Straya’ flag that is tied around your shoulders as a cape, roll up your sleeves and tuck into this delightful mini pie that will leave you with a soft pie paunch on Australia Day from eating too many of them. Finely slice garlic and mushrooms, and finely dice brown onions. Slice beef into 1cm thick by 4cm long strips, removing the gristle as you go. Heat olive oil in a large saucepan until hot and then pour in sliced beef strips. Cook until starting to turn golden brown on the outside. Pour in the diced onion and garlic. Gently stir until it turns translucent. Add in mushroom slices (600g) and worcestershire sauce (2 tbs) and stir until the mushrooms start to soften and turn golden brown. Pour in tomato paste (50g), red wine (1 cup), beef stock (500ml), rosemary leaves and pepper (1 tbs—this is quite a warm, peppery amount so adjust to your taste). Heat until boiling and then reduce to a low heat and simmer for 1 hour (stir occasionally to stop it sticking to the bottom). Preheat oven to 250 degrees and pull your pastry out of the freezer to defrost. Using a glass, cut out the right sized circles for your pies (make sure you have a bottom AND a top cut out!) Grease a 12-hole cup cake tin and pop in the bottoms of the little circles of pastry. Pop into the oven for 10 mins or until puffed up and golden and then use a fork to press down the puffed up pastry. After 1 hour simmering away, check on the beef mixture. The beef should be tender and almost falling apart and it should have reduced to a thick gravy-like stew. Dollop out the mixture into the cooked pastry bottoms and then gently rest the pastry, circle lids on top, squeezing down the edges. Using a sharp knife, cut a hole in the middle, to let the steam escape. Using a pastry brush, gently baste the top of the pies. Pop into the oven for 20 mins or until the lids are gloriously golden. Pull out your pies when they are golden brown and allow to cool slightly before eating. Looking for more recipe inspo? Check out Two Super Salads To Take To Your Next BBQ!